Many businesses are sending SMS text messages to their customers these days for communications. Typically, SMS is used for sending appointment reminders, requesting customer reviews, shipping updates & notifications, and more. But is it legal to send SMS text messages to consumers? Why Even Bother with Sending SMS Text Messages from My Business? With email being almost irrelevant, SMS is clearly the best way to communicate with your customers… as long as you get their approval first. Salespeople i any field should be racing to find an SMS communication solution. Knowing SMS messages are opened over 90% of the time and read typically within three minutes of receipt, it’s safe to say that timely SMS messages can lead to more sales. Most businesses have yet to learn about the benefits and/or use SMS effectively for sales communications. That means there’s never been a better time to gain traction over a competitor than right now. What better an opportunity for those in sales than right now, knowing that most businesses are not using SMS efficiently. Whether it be appointment reminders, upcoming oil changes, or even things like video messaging alerts and test-drive confirmations like the ones found in Build-a-Brand, SMS gives you access to the most precious commodity on the planet right now – People’s attention. Non-medical businesses typically fall under FCC regulations, and this is where the advice of an attorney is critical. There are some hoops businesses must jump through in order to send SMS text messages to their customers, legally. In the medical world SMS regulations get interesting. When medical offices and hospitals send SMS text messages to patients it falls under HIPAA regulations. HIPAA requires very specific private messaging protocols be used for communications of any kind. This disqualifies most virtual business phone/SMS systems from being eligible. The most important FCC regulation deals with prior consent. Prior consent means getting approval from your customers before you start sending them SMS messages. This can be done by getting written approval in your everyday documentation where customers sign for most anything. If not getting written prior consent from your customers, you can always go the digital route. This means asking your customer verbally if you can send them an SMS, followed by sending them an opt-in SMS message. If they approve, you can then send them SMS messages. If they decline, it’s wise to never send them an SMS message, or you could be liable. Quality marketing and branding softwares like Build-a-Brand’s Connection Builder, Review Builder and Social Builder we’re built from the ground up with SMS messaging in mind. These softwares automatically send an opt-in message to consumers asking for their approval, track the approvals and declines, and then prevent SMS messages from being sent to those who have opted-out. 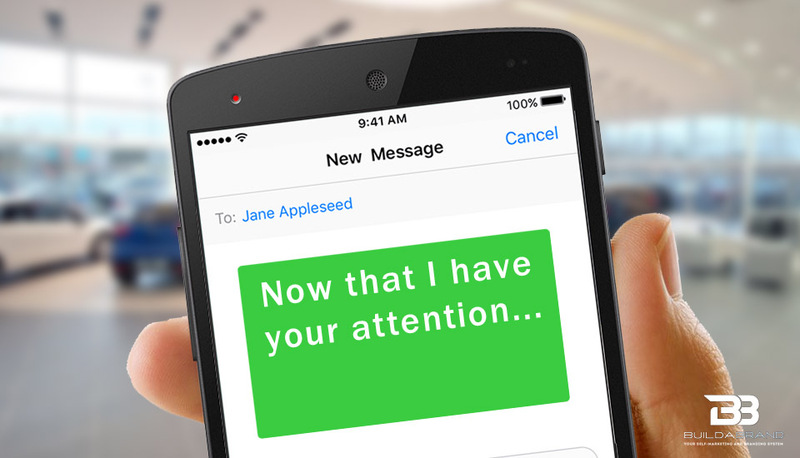 How will you use SMS text messaging for your business? This article is being offered for entertainment purposes only, and is not to be considered legal advice in any way, shape or form. Please seek the advice of an attorney regarding SMS text communications laws for your business.